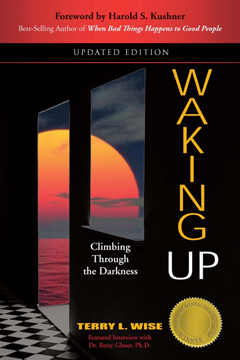 Terry Wise’s book, Waking Up, is a remarkable achievement; it’s a story of pain, hope and resilience. It’s a story of loss, a story of recovery, a story of personal courage, and story of growth; it’s a story that helps all of us remember the importance and life-sustaining nature of relationships. Terry provides a gripping and unique account of her own struggle with loss, grief, and near lethal depression. For those in the helping professions, this book is a must read. It will help both the novice and seasoned therapist understand the importance of the relationship in the treatment process and the need to be flexible and responsive. Terry’s story reminds us that healing, although framed in science, is still very much an art. Terry reminds us that treatment works because of warmth, caring and dogged persistence. Terry reminds us that treatment, just like life, is a process, one that can be skillfully guided in a direction facilitating recovery. For those struggling with depression and suicidal thoughts, Terry’s book is a reminder that even when you think it impossible, you can connect and find a reason for living, that even when shouldering seemingly unbearable pain and feelings of aloneness, there are those that care enough to help. In the end, Terry’s story is one of hope and the joyous wonder of life itself.